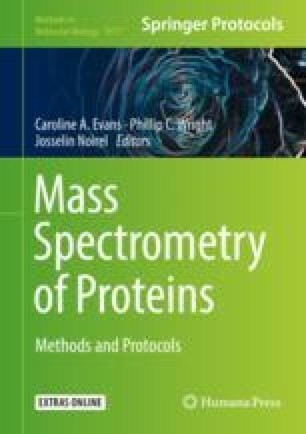 Mass spectrometry (MS) is a sensitive analytical technique with wide application across the sciences including for the detection of peptides and proteins in biological analysis. Ubiquitinated (Ub) proteins are typically analyzed by proteolytic digestion and subsequent chromatographic separation followed by MS detection of the resulting isopeptides. Here we describe a novel method which enables enhanced detection of this important posttranslational modification (PTM) by use of a simple chemical labeling strategy prior to Data-Independent Acquisition (DIA) using a SWATH-based acquisition approach on a suitable Quadrupole-Time-Of-Flight (Q-TOF) mass spectrometer. We would like to acknowledge our coauthors on the original paper , for their equal contribution to the development of the MEDUSA workflow described herein.